Available from 10 to 80 HP, 30-125 BHP,15-300 steam, 30-160 hot water. Totally new design industrial grade construction, 2-Pass fire tube design with enhanced heat transfer features. The VIX Series can offer higher efficiencies than standard vertical boilers. It’s 100% water backed and built to deliver years of reliable service. No burned-out side walls primary flue gases pass via water backed heat transfer tubes. No refractory backed finned passages to burn out. 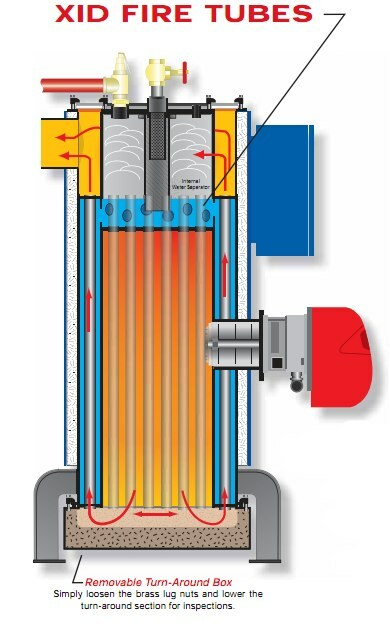 Smaller foot print… more than 50% of standard vertical boilers. Extended heating surface the VIX Series optimizes heat transfer with technology advanced fire tubes. These ultra-efficient tubes capture and transfer heat well beyond the curve of standard fire tubes, eliminating the need for turbulator inserts required for achieving optimal efficiencies. Easy access to burner and eye-high control panel. All valves and controls located within reach. Removable turn-around box. Simply loosen the lug nuts and lower the turn-around section for easy inspection. Innovative vessel design constant calm water levels with water-to-steam stabilization features. Large steam chamber with internal water separator ensures “dry” highest quality steam.